This classic Land Cruiser was custom-built for cool countryside drives and around-town adventures in Northern Virginia. 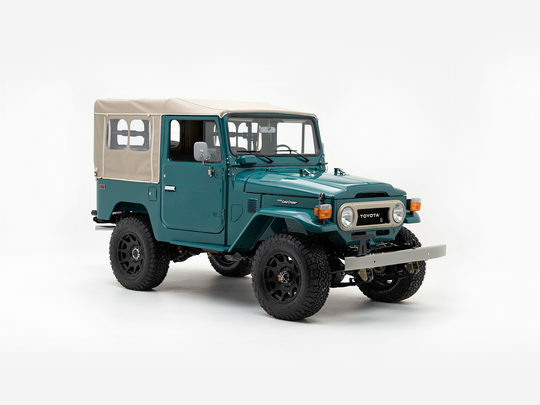 This head-turning FJ40 turns up the heat with a bold set of tires and revitalized powertrain. This FJ40 was remade in its own image - its original body perfected and painted Rustic Green - a color that looks just right with our custom-tailored soft top in tan. Method Roost Matte Black wheels give this FJ40 a serious attitude adjustment, updating its heritage looks with a hint of modern menace. At the heart of this operation, you’ll find the ever-formidable Toyota 2F engine - the preferred choice of those who want that classic Land Cruiser feel. A smooth-shifting 5-speed transmission, upgraded suspension, and power steering give this well-rounded warrior a capable, yet comfortable edge over the original. The cabin of this FJ40 is an inspired blend of classic details and modern tech. Up front, the 60/40 split bench, exposed bolts, and classic gauges take center stage, while subtle modern features invite you to get into your comfort zone. That retro look you love now comes with equipped with a more modern powertrain. Build your own G40 Heritage by The FJ Company today!